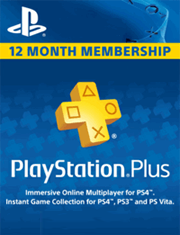 PLAYSTATION Plus 12 Month 365 Day PSN Membership PS3 PS4 PS Vita UK NO CODE !! PlayStation Plus 12 Month 365 Day PSN Membership PS3 PS4 PS Vita UK NO CODE !! !